For greater support and comfort than ever before, this versatile Perform Tri Crop offers quick dry technology to combat warmer conditions. 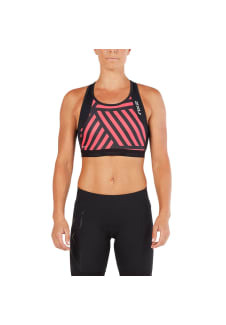 Featuring SBR POWER for unmatched strength and SENSOR MESH X ventilation for supreme moisture management, this stylish, reliable crop is the ultimate triathlon companion. Built from 70D elastane, SBR POWER offers unmatched power, durability and strength. Featuring high denier nylon yarn for impressive support and moisture management, plus a mid level gauge for stability. Utilizing a nylon-LYCRA® fiber matrix with high filament hydrophilic nylon yarn and optimal airflow engineering, SENSOR MESH X represents the ultimate in moisture management. With LYCRA® fiber from INVISTA, unparalleled comfort is assured.